DECIDING FACTORS MMS JUNE 2018 24 mmsonline.com Data-Driven Manufacturing Turning the Shopfloor Workforce into Virtual Visionaries As a staple of films like "Total Recall" and "The Matrix," virtual reality (VR) is slowly making its way out of the realm of science fiction and into the reality of the manufacturing workplace. VR is a computer simulation that is designed to rep- licate a "real-world" experience. While a film can project real images onto a screen, a VR system is designed to trick your brain into thinking you are part of the action. The essential interface of most VR systems is a headset that projects visual information on a screen directly in front of the eyes. By turning the head, the user changes the perspective of the footage on the VR screen. One VR program, for example, simulates a sweeping view from the Smoky Mountains, enabling the user to guide the camera by turning his or her head. Using this technology, augmented reality (AR) programs project digital information over the user's real-world vision to highlight objects and provide information to that person. If, for example, someone was watching a baseball game using an AR system, a yellow line could track a pitched ball while the scoreboard information was displayed to the side, including the count and pitch speed. All this added information would appear in front of the user's eyes to augment the experience of watching the game and make it more engaging. Cemtrex VR (Farmingdale, New York) has been developing this technology for use in manufacturing environments under the name WorkbenchVR, with a focus on improving assembly workf low. Instead of watching baseball, AR could be used to watch components come together to form a completed product. Though still in its beta stage, the company's AR system is one of the few technologies exploring how AR feedback can improve the capabilities of the manufacturing process. The system uses CAD files to map objects into its virtual interface. Essentially, by uploading the CAD files of the individual pieces of an assembly, the headset can identify them in the real world and highlight them for the user. Theoretically, it would be able to guide the user through assembly and identify any problems such as faulty pieces. 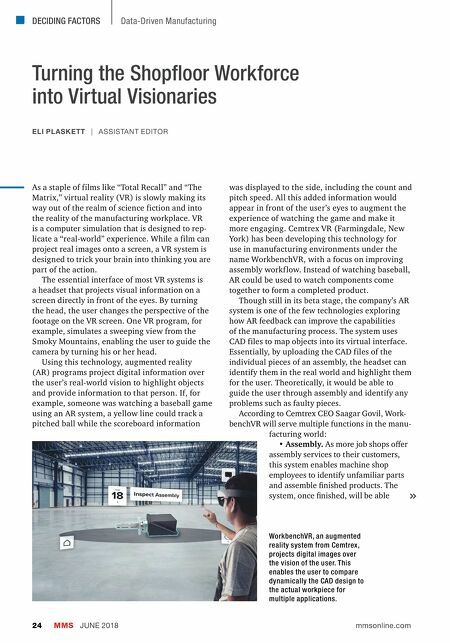 According to Cemtrex CEO Saagar Govil, Work- benchVR will serve multiple functions in the manu- facturing world: • Assembly. As more job shops offer assembly services to their customers, this system enables machine shop employees to identify unfamiliar parts and assemble finished products. The system, once finished, will be able ELI PLASKETT | ASSISTANT EDITOR WorkbenchVR, an augmented reality system from Cemtrex, projects digital images over the vision of the user. 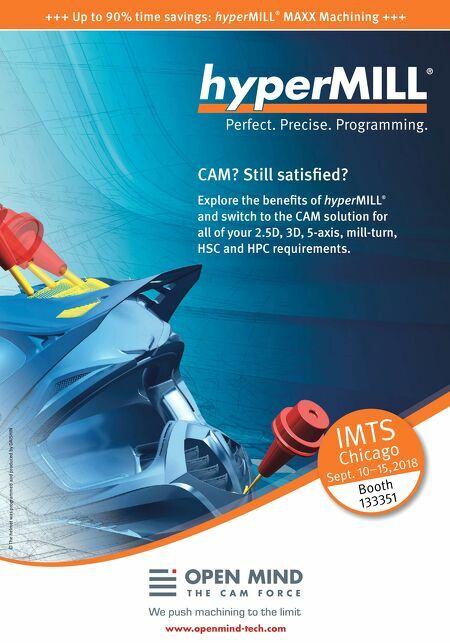 This enables the user to compare dynamically the CAD design to the actual workpiece for multiple applications.